Posted on 18. 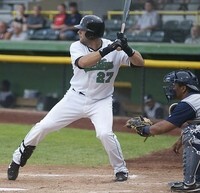 Oct, 2010 by Corey in All, Dayton Dragons Baseball, General Baseball. While watching a Major League Baseball game with my buddies it is common practice for them to ask me lots of questions about certain teams or players. Their reasoning is to try to stump me with their inquiry as they are nowhere near as interested in the game as I am. The funny part is that most of the time they have no idea if my answer is correct or not, but for the most part there is no questioning from them. This past weekend we were hanging out at The Whistle Stop Grill in Blue Ridge, Georgia watching game one of the American League Championship Series. 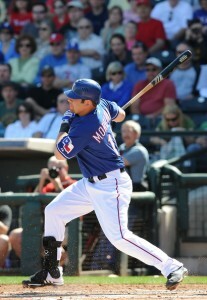 Since most everyone knows common facts about the New York Yankees, most of the questions focused on the Texas Rangers. As usual, I answered them flawlessly, and I swear correctly. My buddy Lenny thought he would have me for sure as the Rangers sent pinch hitter rookie Mitch Moreland to the plate in the ninth inning to face Mariano Rivera. Lenny looked at me and said, “No chance you know anything about this rookie.” I smiled as he roped a single into left to keep the ninth alive. Most people who know anything about Moreland know he was a first baseman and outfielder in the Texas minor league system who always hit for a high average, driving in runs with decent power. But what most people do not know, that I just so happened to, was that Moreland also has pitched in a minor league game with the Clinton Lumberkings during the 2008 season. The reason I know this fact is that I was in the dugout on July 20th, 2008 with the Dayton Dragons as we took on the Lumberkings in Clinton, Iowa. The night before we had a game suspended due to bad weather, and had to finish it up the next afternoon before starting our regular nine inning contest. The completion of the first game ended up going 14 innings taxing both bullpens before game two began minutes later. Dragons came out swinging in game two and we took at 13-4 lead. Out of options in the bullpen and the game out of hand, the Lumberkings put their first baseman on the hill, a lefty prospect named Mitch Moreland. I remember hearing a few players chuckle as Moreland warmed up. Laughter’s soon turned to groans as Moreland’s fastball reached 92 miles per hour and he struck out two in a scoreless inning. After the game, the Clinton pitching coach told our coaching staff that he has been trying to get the Rangers to let Moreland pitch more and hopefully convert him to a pitcher in the near future. Thankfully for the Texas organization, they did not let this happen as Moreland has been a big contributor down the stretch and into the Playoffs for the Rangers. I welcomed and challenged Lenny to research my tale to see if I was telling the truth or not. But as usual, he quickly forgot as the frosty cold beverages continued to pile up in front of him. The next night we were all hanging out watching game two of the ALCS as the Rangers were putting a hurting on the Yankees 7-2. Moreland got the start this night at first base batting ninth. And it all came together during his second at bat where the announcers sent it down to sideline reporter Craig Sager. Sager began to tell the National TV audience about Moreland and his debut on the mound during the 2008 minor league season. A huge smile came across my face as my friends glanced my direction. I am blessed with a good memory when it comes to sports, and look forward to being able to share more stories about minor league players that I have seen from the other dugout.